peek >> << backNew Jersey Avenue looking east toward H St., September 2003. JDLand News Items: Agora/800 New Jersey Ave.
Oct. 15, 2018 - A first look inside the grocery store, a few days before its Oct. 18 grand opening. See more interior photos here. June 16, 2018 - The only photo that really mattered to many eyes. April 14, 2018 - Agora as seen from its next-door neighbor, the Southeast Freeway. 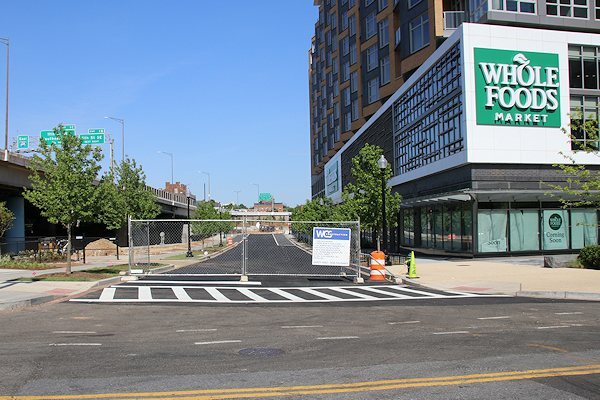 June 16, 2018 - Part of Agora's construction includes a new block of H Street SE, which runs along the building's northern edge. And on the north side of the street, a dog park opened in Sept. 2018. Jan. 5, 2019 - The aforementioned dog park, very much in the shadow of the Southeast Freeway. But the dogs don't mind. Probably. Jan. 22, 2018 - The entrance on New Jersey Avenue. Jan. 22, 2018 - A hint at the views from the building's still under construction roof deck. For more photos from the roof and elsewhere, see this photo gallery. Jan. 22, 2018 - The game room. For more interior photos, see this photo gallery. Jan. 22, 2018 - The living room of the two-bedroom model unit. For more interior photos, see this photo gallery. There was no connection to H Street from New Jersey until construction began on Agora. When complete, Whole Foods will front this stretch of road. June 4, 2017 - The eastern end of Agora, as seen from a block to the south, at 2nd and I. This view of Agora has now gone away as construction continues on the Garrett. June 4, 2017 - The best I can do in terms of getting a street-level shot of the New Jersey Avenue frontage as seen from the southwest. The street needs to be wider. Jan. 22, 2018 - Agora as seen from Garfield Park on the opposite side of the Southeast Freeway, with the Whole Foods space peeking out from underneath. Another rendering of 800 New Jersey and the Park Chelsea, released before the agreement with Whole Foods was finalized (hence the familiar-but-not signage). This is seen from above New Jersey Avenue at H Street. June 21, 2008 - Looking westward along H Street at its intersection with 2nd. After the demolition of the warehouse in 2000, Square 737 spent a number of years as a parking lot. March 17, 2019 - The same location, now a complete street through to New Jersey Avenue, and finally once again available for photos after the completion of the Virginia Avenue Tunnel construction. Now under construction at left is the Garrett. July 18, 2006 - Before work began to redevelop Square 737, Canal Street ran on a strange northwest-then-north path through the block. 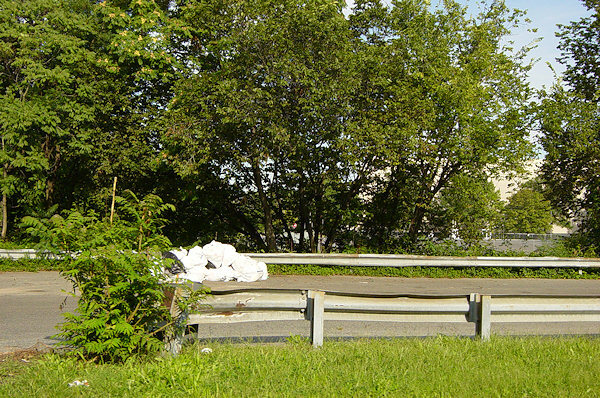 Here is its intersection with H Street, with New Jersey Avenue laying just beyond the overgrowth.